Obama's Kenya Trip Gets Personal As Locals Celebrate Return Of Their "Local Son"
President Obama landed in Kenya on Friday, becoming the first U.S. president to visit the East African nation. Obama's trip to Kenya is personal for the president, as the nation marks the native homeland of his father, Barack Hussein Obama, Sr., who returned to Kenya when the president was a young child. After landing on Friday, Obama reunited with his father's family, including his step-grandmother, in the capital of Nairobi. "This is personal for me," Obama said Saturday while addressing the U.S.-sponsored Global Entrepreneurship Summit. "There's a reason why my name's Barack Hussein Obama. My father comes from these parts." He added that it was "wonderful" to visit Kenya again on his two-day trip. "I am proud to be the first U.S. president to visit Kenya." the president said. If Senator Barack Obama is ever thinking of running for president — or changing careers to rock star — he got excellent practice in Nairobi on Friday. But Obama shocked many when, in 2009, he chose to visit Ghana on his first presidential trip to sub-Saharan Africa, and not Kenya. Despite the slight in 2009, Kenyans still turned out for the return of their "local son," and security was reportedly high in the packed streets of Nairobi. Many Kenyans were proudly using the hashtag #ObamaReturns on Twitter to support and celebrate the American president. At Saturday's economic summit, which is the first to be held in sub-Saharan Africa, Obama announced a $1 billion gift for Kenyan entrepreneurs. During his speech, president placed a special focus on young people. "Africa is on the move," Obama said. "Africa's one the fastest-growing regions in the world. People are being lifted out of poverty. ... And young people like you are harnessing technology to change the way Africa's doing business." The massive gift, and his presence at the economic summit, comes largely as part of the president's Power Africa initiative, which the White House describes as "an innovative partnership to double access to electricity in sub-Saharan Africa." 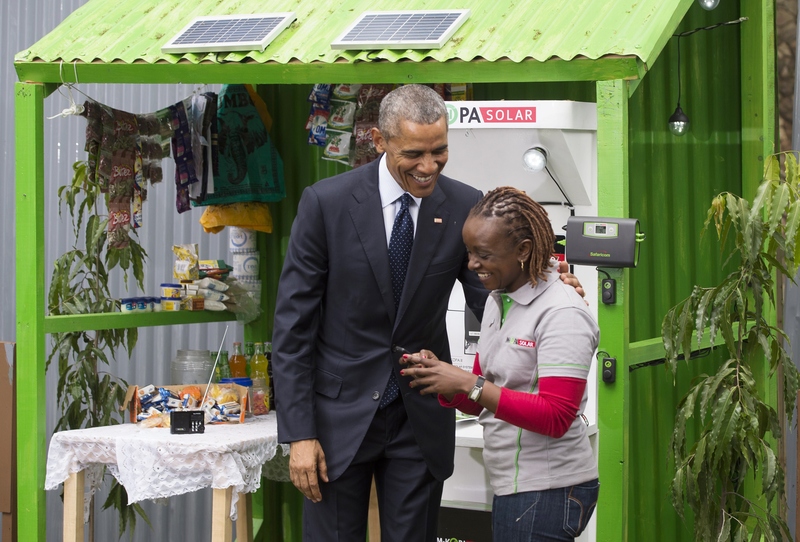 Following his remarks at the summit, Obama met with several Power Africa partners, including those working on solar-powered technology to bring to the continent. Later on Saturday, in a joint press conference with Kenyan President Uhuru Kenyatta, Obama made a promise to return to his father's homeland in the not-too-distant future. "I'll be back," Obama said. "The next time I'll be back, I might not be wearing a suit. ... My hope is that my philanthropic work, when my presidency is over, builds upon some of the things we're doing now."